The name "Pound"cakes was given to the old time cake made with one pound of sugar,one pound of butter,one pound of eggs and one pound of flour.But those cakes were denser compared to the light texture of this pound cake.And so,this cake is slightly modified in ratios compared to the original pound cakes.I have adapted this recipe from here but I reduced the butter slightly in the recipe.This recipe was in my drafts since long but I wasn't satisfied with the pics and so kept postponing to post it.But the taste pulled me back to post this recipe and it tastes similar to the Butter cake that I posted sometime back.So,enjoy the slice with tea !!! In a large bowl,mix the eggs,vanilla extract and milk.In another bowl,sift the flour,baking powder and salt. Preheat oven to 350 degrees F and line a loaf pan (9*5*3) with parchment paper at the bottom and butter the sides of the pan. In the bowl with dry ingredients,add the room temperature butter and half of the egg mixture.Beat on medium speed until the dry ingredients are moistened.Scrape down the sides and add the remaining egg mixture and beat for 30 secs until incorporated. Pour the batter in the prepared pan and smooth the top with a offset spatula or the back of spoon. Bake in the oven for 55-65 minutes (I finished it at 55mins) or a tooth pick inserted comes out clean. Cool on wire rack for 10 minutes,then remove from pan and cool again before cutting slices. 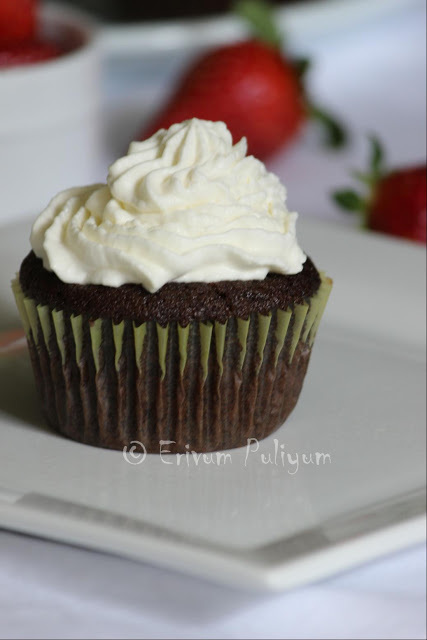 * You can substitute cake flour by mixing all purpose flour and corn starch.For 1cup of cake flour : Add 2tbsp of corn starch and fill the rest(remaining cup) with all purpose flour. * The original recipe calls for 13 tbsp of butter,you can do that way too.But using 11tbsp also yielded almost the same buttery flavor. 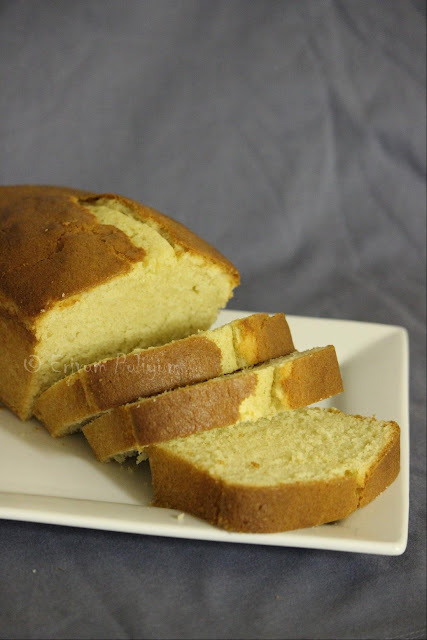 The last time i had a pound cake, i was in Bloomington years back(the only difference was that the pound cake had 'sugar glaze' flowing over), I totally forgot this simple & very tasty recipe existed!! Thanks for bringing back my memories. Very nice, very inviting too!! 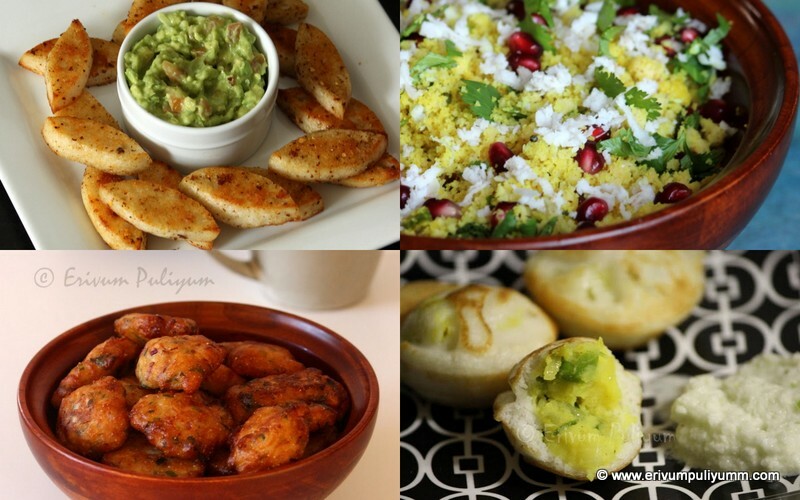 Yes, with a cup of tea this is a killer combination!! Luv this delicious cake with some coffee. love pound cake, made chocolate chip one and gone in two days. just love yours , dollop of vanilla icecream and done. Pound cake looks delicious.My son loves it so much.Book marking it. Super soft cake, love to grab a slice and have with a cup of masala chai. Yummy soft moist butter cake. You are always a perfect baker dear. wow so moist and so soft!!! looks so perfect!!! Wow looks super moist and soft Julie..Can I have a piece? Perfectly done Julie, the cake looks superb..
Soft n juicy cake..want to have a slice! 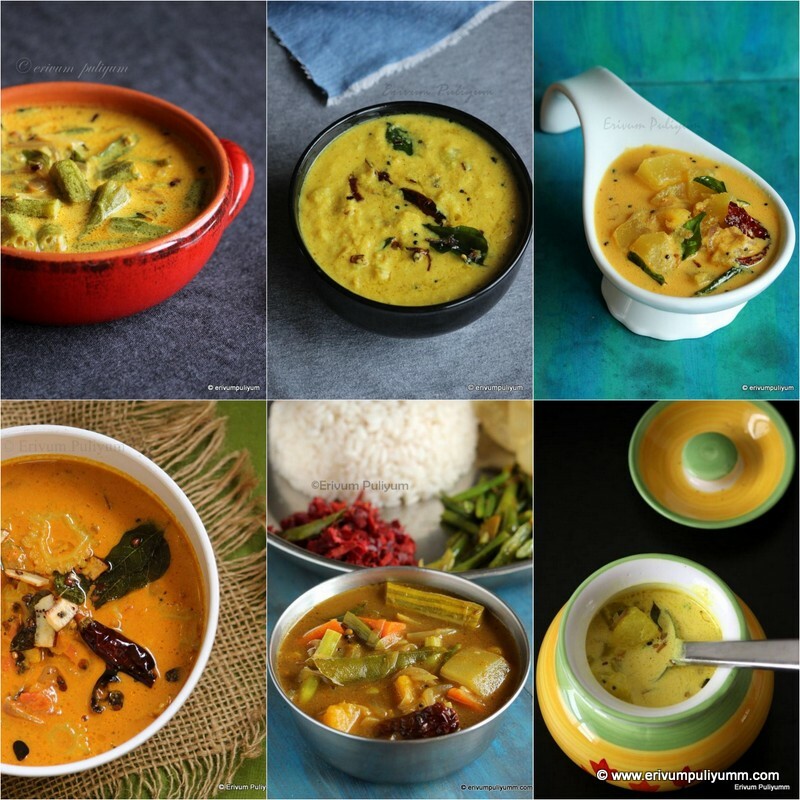 nice clicks julie.. will try it soon.. Very tempting and inviting cake. Delicious!! I adore this simple cake. Pound Cake looks simple and tasty. So soft n light cake, perfect for tea time snack...loved ur clicks ! 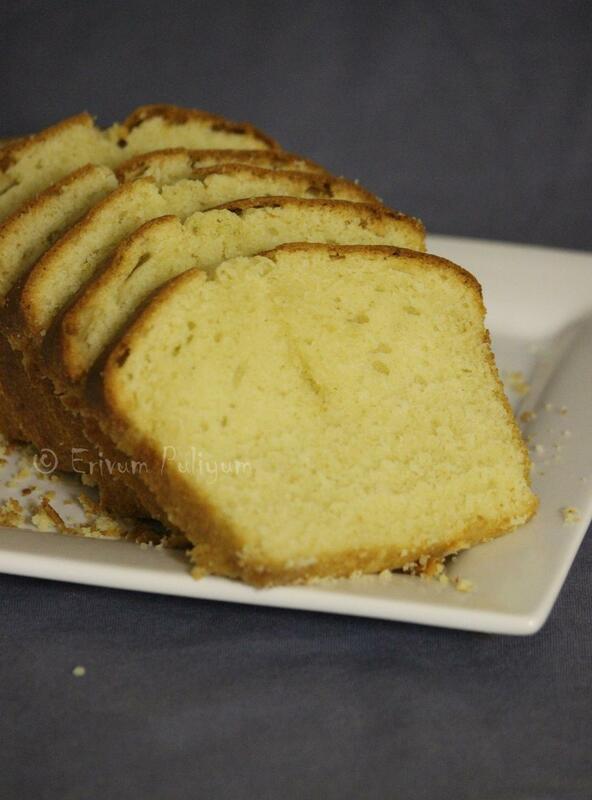 Your pound cake looks PERFECT! perfect and super delicious cake. Cake looks rich n yumm.The good thing about this cake is u dont need any frosting.. 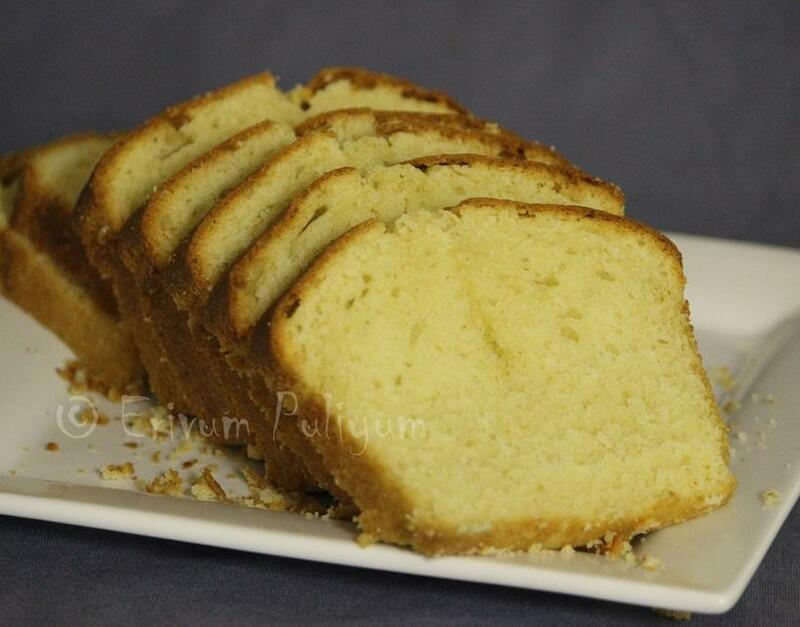 Pound cake so inviting.. Yummy yummy !! Pond cake looks so soft...yummy...loved the colour and taste.. Pound cake looks so good, Julie, you can see the individual crumb- my daughter asked me to make this the other day- I think I'll try yours. Such a lovely texture, it looks picture perfect!